“How about the complementary colors, the ones opposite each other on the wheel? Where are the tints and the shades?” I quizzed. I got out my watercolor kit and sent Ayla with a jar to the sink for water. I gave her a small panel of thick textured paper. Hmmm . . . impressive. Thinking about values, to myself I said “fortissimo” and “pianissimo, too,” but I kept silent and let Ayla paint her own rainbow. Imagine my delight when my oil painting students announced they wanted to exhibit their art work. I love to support initiative. It would be at Nani’s house. They would invite just family and a few friends for a private showing. Each of us would bring heavy pupu which means hors d’oeuvres substantial enough for dinner. Wine would be served. Personally, I think it was an excuse to drink wine. Only people who drank wine would be invited! they said. 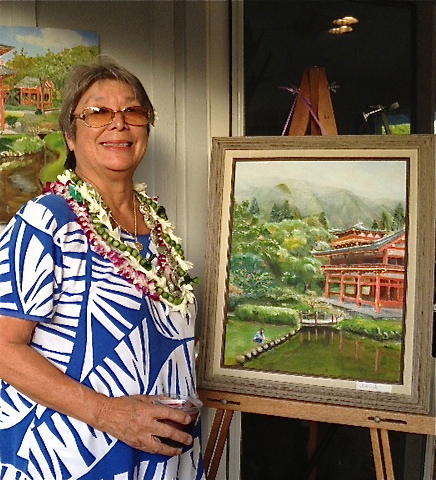 Grouping of paintings includes images of Moanalua Gardens. At left: Prince Lot’s cottage by Leinani Keppeler-Bortles. Center: Kamaipuupaa hula mound by Rebekah Luke. Bottom: Chinese Hall by Rae Gorman. 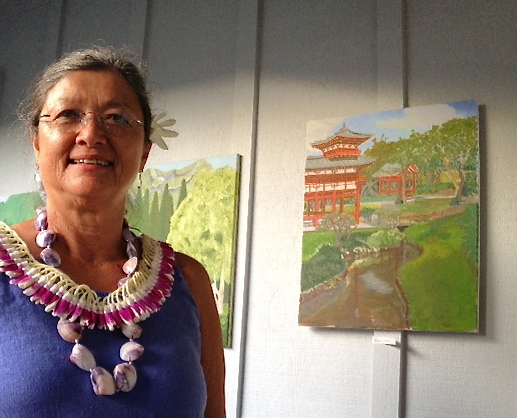 Right: Lo’i kalo (pu‘epu‘e style) by Rae Gorman. Some background: This is the first cohort of students, now in Painting III (Landscape En Plein Air). They completed Painting I and II in the studio. Now students have graduated and are painting on location for the first time. They go out with me two times each to five locations, for a total of ten outings. After that students may finish their paintings on their own. It will be typical to repeat this course until they are comfortable in the landscape with its constantly changing light and weather. Setting a show date turned out to be good incentive for finishing the paintings. 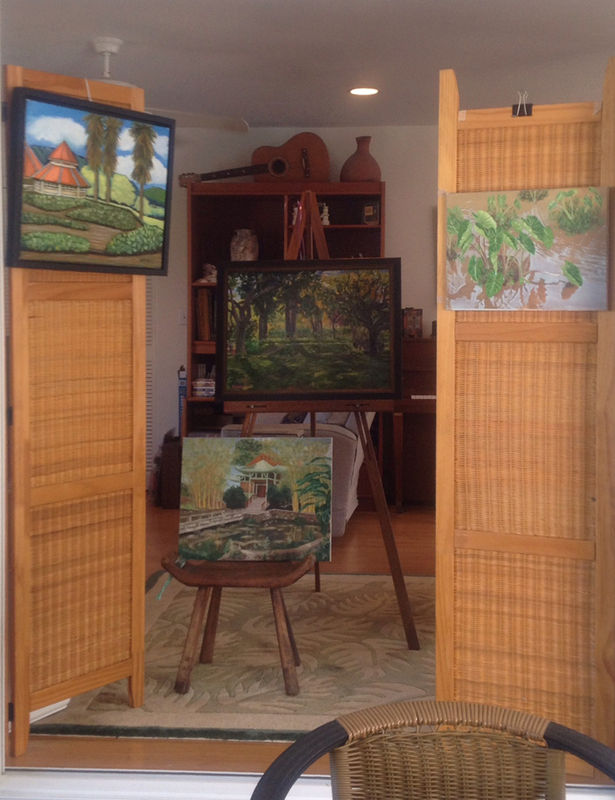 We had paintings in progress from Moanalua Gardens, Byodo-In, Kapiolani Park, the farm at Castle High School, and Kaaawa Beach Park. I kept out of the planning until about a week ago when Nani asked how best to display the art work. I took interest because (a little ego here ;-)) an invitation went out with my name printed prominently. I had not seen any of the finished paintings. This is something I teach later, but in this case, students learned “on the job” by trial and error as we staged Nani’s home to look like a gallery. It reminded me of a restaurant opening, at which the carpenters are still hammering away as the first guests walk in the door. About 50 people came to the show, expressing thanks, congratulations and compliments all around. It was a happy occasion, as you can tell by the smiles in the photos. Good work! I am so proud of you. Keep going! Continue to turn the form. Darker darks and lighter lights. Warm it in the light. Cool it in the shade. Avoid comparing your work to others’ because each artist has her own line. Paint what you see, paint what you know, paint what you feel. Oh, and drink wine! The child got up from her chair in the middle of class, twice, sat on the floor in the lotus position, closed her eyes and ohm-ed audibly. 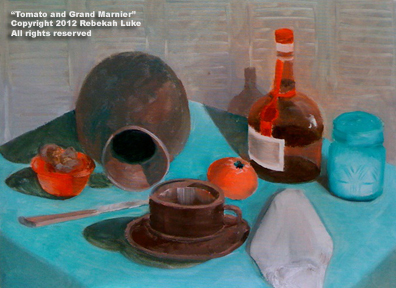 In the bucket-list painting class, an adult began to doze. Out in the landscape I wondered if my suggestions were simply going in one ear, if at all, and out the other. I don’t have a Hawaii fifth-year university teaching certificate, but I do have a few years experience in the field under my belt and consider myself in the “working professional” class of faculty, like the teachers who taught me—desirable by a top art school I know and distinguished for excellence from the rest. But in the first Saturdays of February, I see I can still learn something about human nature and various styles of learning. I’m finding it a challenge. And I like challenge! Like DH who’s developed an immense respect for mothers since taking on the role of caregiver for his two granddaughters, now ages 3 and 1, since their birth, now I have a huge respect for classroom teachers. We each come to “class” with different paradigms, different backgrounds and existing points of view, and previously learned behaviors. Somewhere, sometime, I hope the twain will meet. If I may generalize, there are two approaches to teaching/learning art. One is by beginning with the basics and then allowing our abilities and talent to develop. The other is for students to freely express themselves, uninhibited, and color “outside of the box” right from the beginning. I advocate starting with the basics. By learning the basics, what follows is so much easier. In visual art, much is about the logic of light. In life, much is about kindness, gratitude, and respect. One of the reasons I decided to offer art lessons to kids in the neighborhood is that the public schools allegedly do not teach it anymore. It appears there is more than art that they aren’t teaching anymore, i.e., I see what other educators describe as “out of control” in my own studio. The other reason is I want to pass on what I know how to do and give something back to my community in return for what I have received. There are two adult students this semester who wanted to join an advanced class without taking the basic courses. Before giving the okay, I asked to see their portfolios or that they enroll in Painting I—in fairness to the other students who have done the lessons in sequence and to have everyone on the same “page.” I am so glad I did because it prepared me for their added and different energies, and to spot what is missing. Both my youth and adult classes are designed with the same curriculum, but the lessons naturally vary. For the children, who are bright youngsters, I know I must change the activities often to accommodate their attention span and high energy, as well as to challenge them so they don’t get bored and act out. I give them individual attention, rest breaks, and try to make the time fun with surprises. They really keep me on my toes! As for the adults, I understand that we are older now and perhaps our brains are starting to slow down, so I will be patient and offer reinforcement, such as assigned chapters to read in the textbook in addition to demonstrations. I’ll encourage them to remain open and to try something new, even though they are used to doing things in a familiar way. Colds and flu have been reasons for absences already, but, yes, please stay home if you are ill and you can catch up later. We will wash our hands when we first arrive, just as we learned in early ed. I wish we would all get a good night’s sleep on Friday and eat breakfast before coming to class. Do meditate first. Then, please show up with your tuned senses. I am happy to share what I know. And as your aunty and kumu (teacher), I am so very grateful to learn from you. When I have a red-letter day, like Saturday was, I try to try to savor and remember the feeling. It’s sweet incentive for living and loving life to the fullest. Then I may be open to welcome the next time. Because the feeling is amazing. To that end, I’ve decided to turn over another leaf by resisting the urge first thing in the morning to reach for an electronic device to see what happened overnight while I was sleeping. I will wait until after I practice tai chi—currently the saber set, breakfast without the TV news or the sound of a ball game, and a walk with the dogs on the beach. I will eat healthy foods, exercise, and meditate. 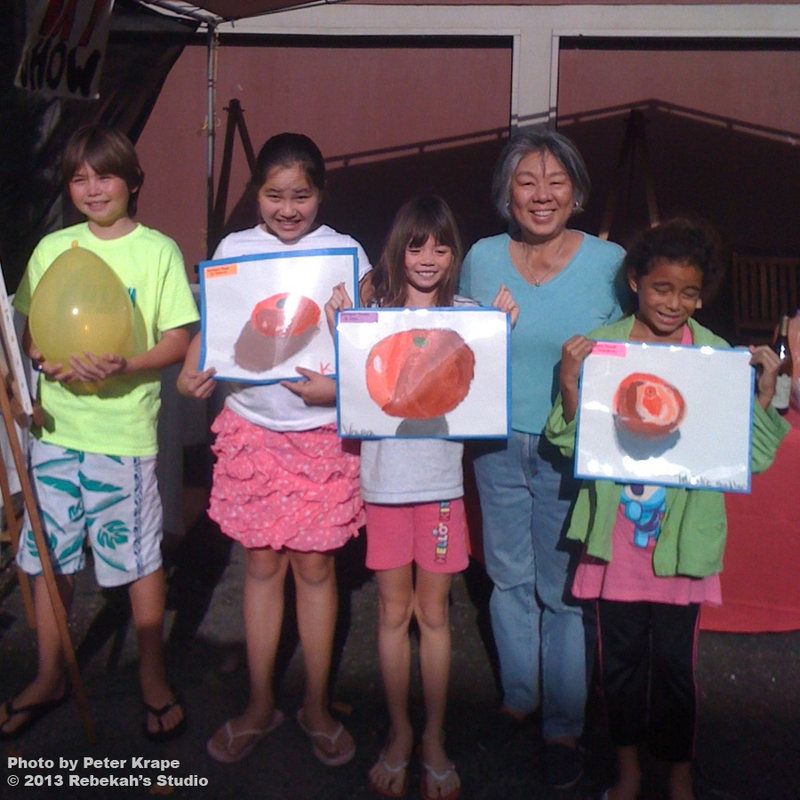 Saturday began with three neighborhood girls and one boy arriving at the studio at 8 a.m. for their first art class with Aunty Rebekah. 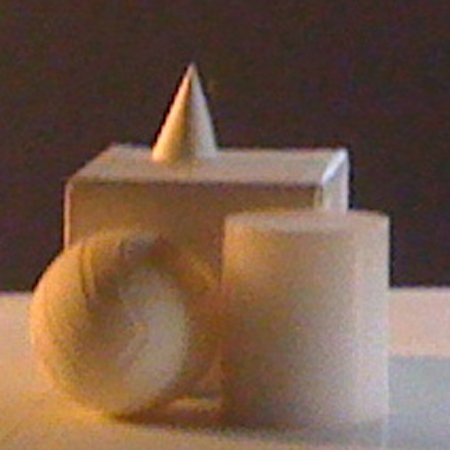 I am offering the same basics to youth as to my adult Bucket List painting students: ball, cube, cylinder, and cone. The kids were great and kept me on my toes. It was nice to have 10-year-old-boy energy in the studio. His mother wondered if perhaps he wouldn’t like the class if he was the only boy. For the exercise of drawing a ball, Jefferson filled a balloon with water and inflated it. Of course, the balloon eventually popped, but we agreed beforehand he would have to clean it up. I think he likes the girls. A couple of the kids hadn’t eaten breakfast, so I’m glad I had two oranges in the set. 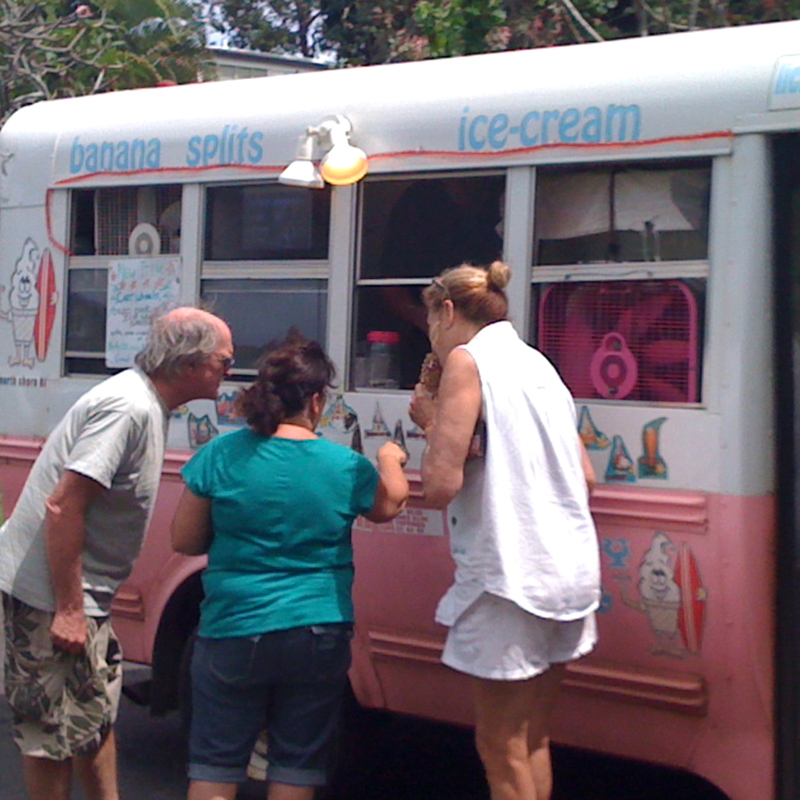 When I cut them into slices to show ellipses, their eyes grew wide with appetite, and we all had a refreshing snack. The dogs Alice Brown and Pua were in heaven during recess with all the attention. Later, to get the kids to finish their drawings, I brought out some cones—sugar cones that DH thoughtfully bought when he saw me searching for a cone shape for the lesson—and a carton of ice cream. Then I went to play at the annual Punahou Carnival. It’s the famous fund-raising event of my alma mater where I perform with the Punahou Alumni Glee Club, sometimes provide paintings for the Art Gallery, and work in a booth with my classmates. Punahou School is super organized and makes money for the student financial aid program—how my parents could afford Punahou for me—by getting the junior class, their parents, and the alumni to donate goods and volunteer their labor. I adore the camaraderie of the glee club, not to mention the chance to sing and dance. 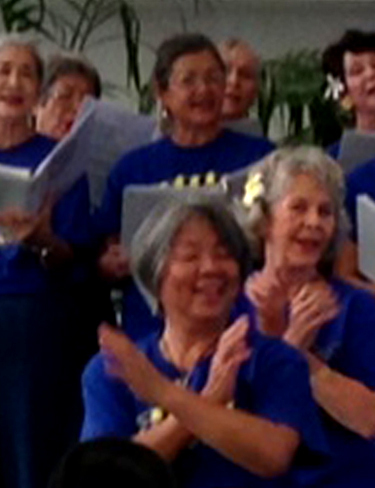 We rehearse weekly, and our director is skillful at getting our choir to peak for our performances. We sounded good and had an enjoyable time with the music. The Class of ’67 . . . what can I say, except that we are tight. For example, Christine flew in from Arizona just to help serve laulaus for 3 hours. 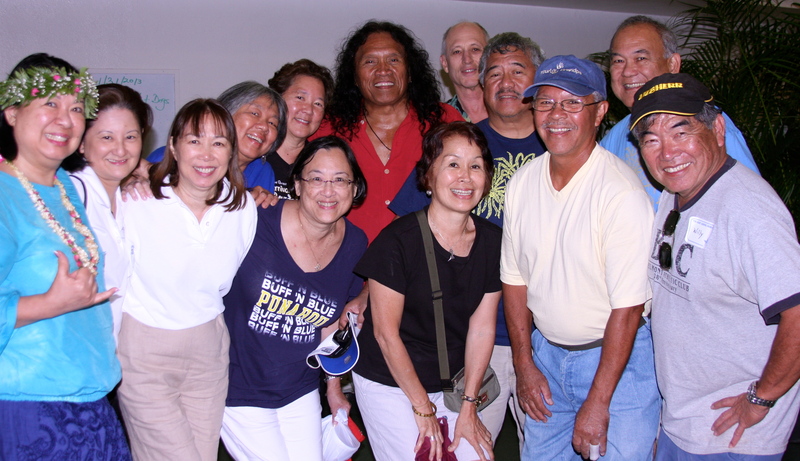 Every year we rendezvous at the Carnival to see each other briefly, hear our classmate Henry Kapono Kaaihue entertain in the cafeteria, and then go our separate ways again. It’s so nice to see everyone. 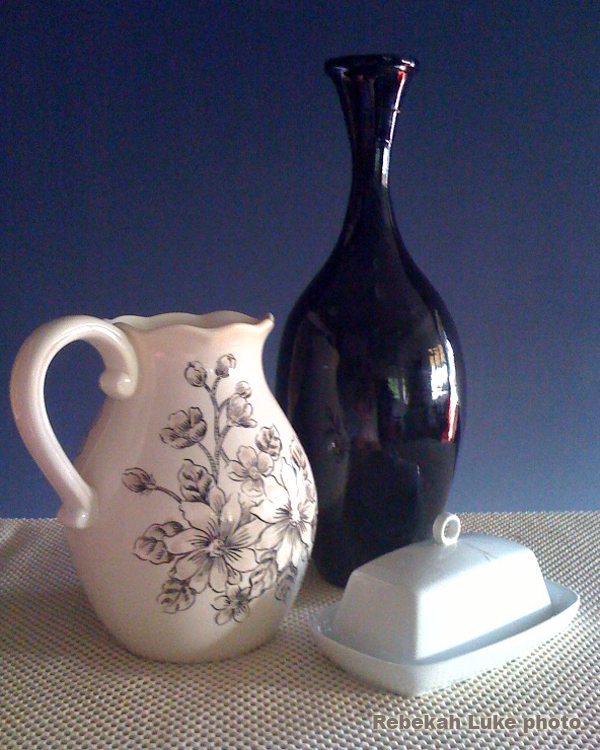 That would have been plenty, but the surprising joy of the day was the sale of my paintings by the Art Gallery! It was exciting! 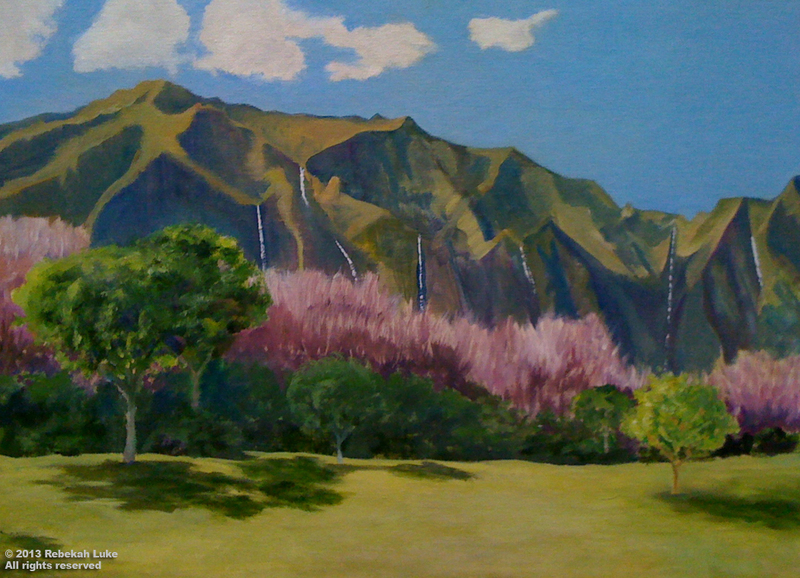 I painted the scene of the Ko‘olau Mountains from the spot where I go often with my painting group. It began on a spectacular clear day with hardly any clouds to hide the top ridge. The panorama was breathtaking, and I decided to turn it into a diptych of two horizontal paintings side by side. “Lanihuli Diptych” is my most recent art work. I didn’t plan on taking anything to the Carnival because I’d not been successful in sales any previous years there. But my glee sister Tamson Fox, a full-time fine artist, reminded me in January the event was coming up. I’m so grateful to her for changing my mind. Still giddy with delight and with my new earnings burning a hole in my pocket, I headed to the Diamond Head end of the midway and bought myself a present—a bling-y Pāʻani top with a night-blooming cereus flower. DH and I hung out to catch my cousin Sunway’s performance with her band before it was time to go home. We negotiated with the “O” men in the produce tent over the script price for the avocados. They let us keep enough to buy one malasada doughnut each for the ride home. Yummy sugary goodness. Never mind the resolution to eat healthy. I’m celebrating! It was the perfect ending to my amazing red-letter day. 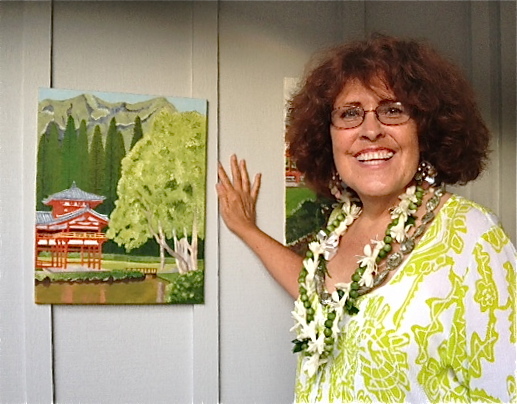 Lanihuli Diptych, left panel, sold! 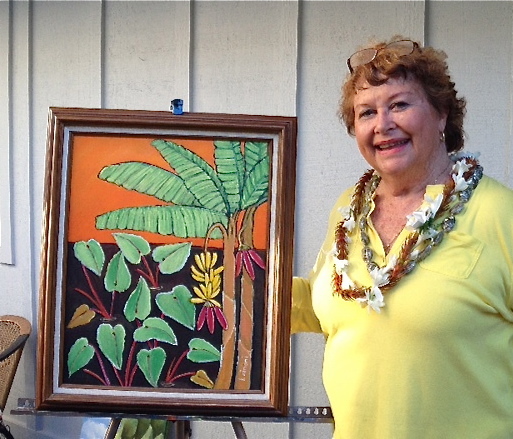 Lanihuli Diptych, right panel, sold! I can teach you how to paint! While my art students are on a little break from class—they’re vacationing in Turkey!—I’ve decided to show you what we’ve done so far in Painting I. Each week I welcome students with a studio tabletop set-up, explain the lesson, and do the lesson with them. 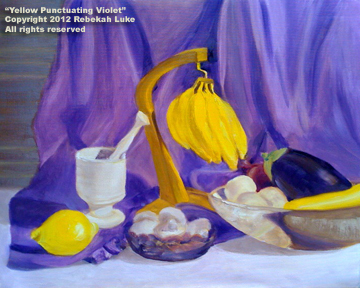 We paint these assignments after practicing basic drawing and perspective, and learning about the values of light. I urge students to not paint from a photograph, preferring that they draw and paint from life and the “local color” cues they should put down in the beginning. However, the now-ubiquitous digital camera phone and that the set is not available for viewing once the class is over for the day make it difficult to not refer to a photo. The problem is, for beginners especially, if you paint from a photograph, the painting will look like a photograph. I think a painting is more interesting when it shows the artist’s individual line, imperfections included. Looseness will develop with time. The painting. Monochromatic color lesson: adding one hue only, veridian, to black and white, still mindful of the range of values, that is, the various tints and shades of gray. Lesson includes painting glass. The set. 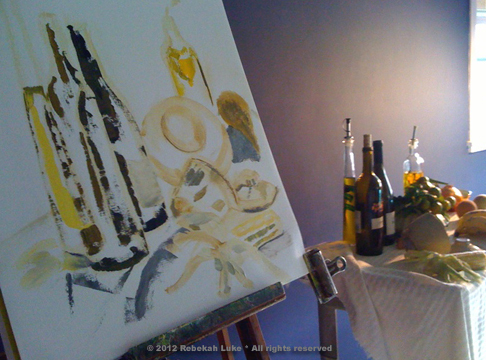 Analogous color painting lesson with black, white, and three yellows. Black mixed with yellow makes green. The painting. 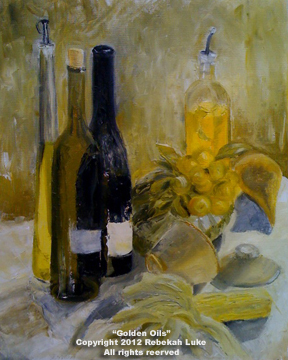 Using cadium yellow pale (cool yellow), cadmium yellow light (warm yellow), yellow ochre, black, and white. The painting. The combinations of mixing cadmium red light (red-orange) and veridian (blue-green) represent the first of four lessons about complementary colors, that is, colors that are opposite each other on the color wheel. Combining complementary colors produces neutrals that are stronger than tube paints named for earth tones. The set. 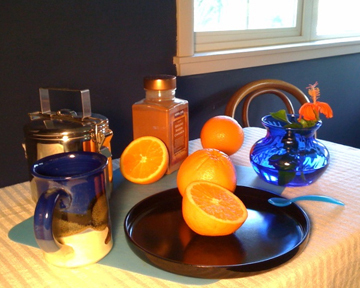 Complementary colors blue and orange with shiny metal, glass, reflective surfaces, highlights (the incandescent spot) and low lights (from the window light). The painting. 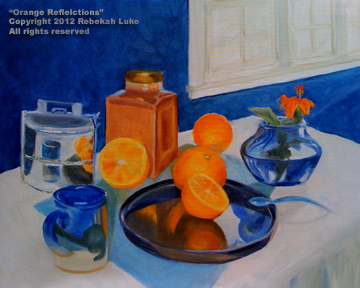 Though challenging, it is much fun to paint reflected light. The set. The complements yellow and violet mix to make warm tans and browns. Of light rays passing through a prism, yellow is the lightest value, and violet is the darkest. 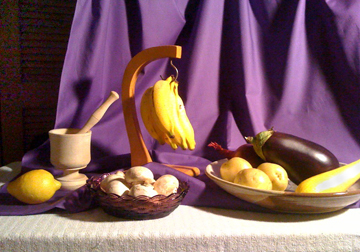 This still life set introduces drapery. The painting. 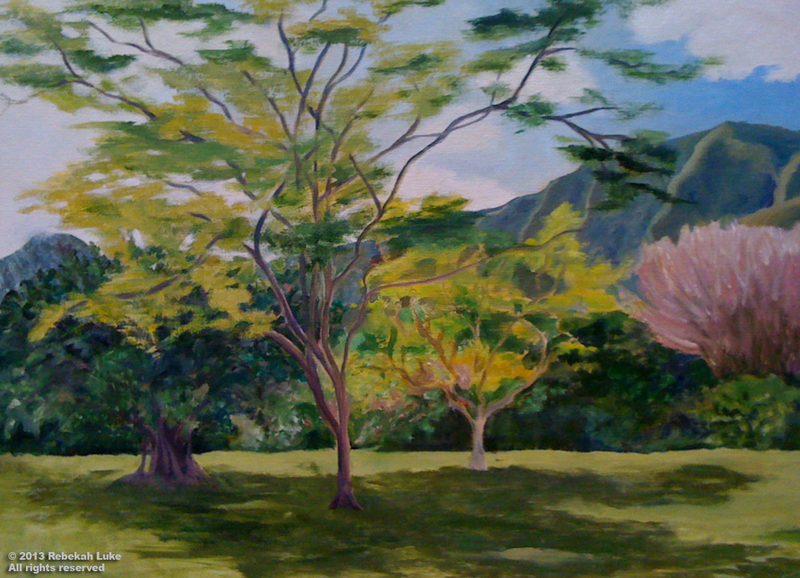 Painting drapes in the studio now is good practice for painting the Ko‘olau Mountains in the landscape later! 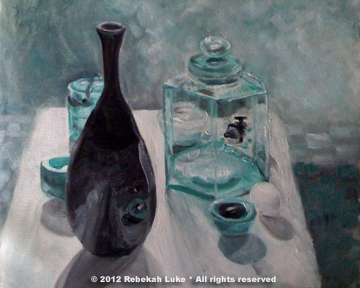 To learn more about painting lessons by Rebekah, please see the related post: Is painting on your bucket list?